You may receive an error message in Mac OS X Mail when you try to delete or archive an email message. The message “” could not be moved to the mailbox (null). The destination mailbox does not exist. If the email account you are moving the email message with is using IMAP, it is possible you do not have the Archive of Delete folders enabled (turned on) in your email hosting provider. You can control IMAP mailbox folders that appear in the Mac OS X Mail application by logging into your email account through a web browser (see example for Gmail IMAP folders) and adjusting them as so. 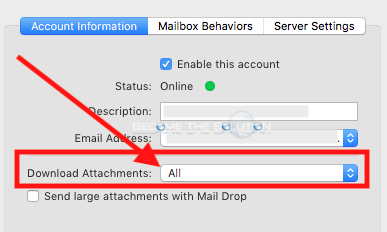 Some report if you do not have Download Attachments: All enabled for your IMAP email account(s), there is unexpected results with your IMAP mailboxes and Mac Mail. Enable download attachments for all your IMAP accounts. Go to Mail -> Preferences -> select an IMAP account -> Account Information.